FILE - A Congolese health worker administers Ebola vaccine to a boy who had contact with an Ebola sufferer in the village of Mangina in North Kivu province of the Democratic Republic of the Congo, Aug. 18, 2018. The Democratic Republic of Congo has yet another Ebola outbreak, its 10th since the virus was first identified in 1976. This latest outbreak started in early August in the eastern part of the Democratic Republic of Congo, and the fatality rate is 70 percent. Dr. Anthony Fauci at the National Institutes of Health points to experimental treatments for those who have Ebola, one thing that didn’t exist during the outbreak in West Africa. “We have five therapeutics that are available, three of which were being used actively,” he said. The treatment is called monoclonal antibody 114. Fauci says it’s being given to Ebola patients in the DRC. Many more people need to receive this treatment — and the two others — before we know if any of them actually work. 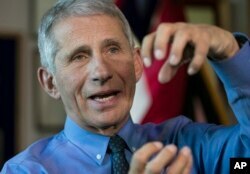 “We’re proposing a trial to compare one treatment to another treatment to another treatment,” Fauci said. Another tool that doctors have this time is a vaccine that protects people from getting Ebola. The vaccine wasn’t available during the height of the outbreak in West Africa. The outbreak is in a conflict zone, so health workers can’t get to everyone who needs treatment or a vaccine.